Semi Truck Decals are Printed in Full Color and can be Shape Cut or Square Cut - Order your Decals Today! Add some flare to your Semi Truck by adding custom lettering! 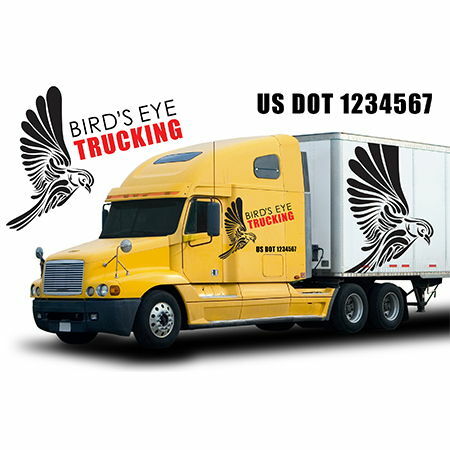 You can add your company name, city, state, phone number and DOT number to the truck door. Our decals can be square cut or shape cut around the lettering. We can also print decals for full semi truck wraps. We do recommend our 3M Controltac material for truck decals and wraps as it has air release channels which makes it very easy to install. If you are looking for shape cut decals, we recommend working with one of our customer service representatives to ensure that the artwork file is set up correctly and will print the way you want it to.